In CellSmart POS a product is a name of an item that you can save in the software. When you create a new product you are saving the product name in the software with its details. Creating a product will not add the product to your inventory. To add a product to your inventory you must create a new purchase. Creating a product will allow you to sell the product, put it on layaway, purchase the product and etc. You are able to create products for services, repair devices, payments and used items. Click on the New tab. Then click on the Product icon. Enter or generate the UPC/SKU code of the product. Select the category of the product by clicking on the drop-down menu OR create a new one by clicking on the add new category button. Click the Create Product in one store button. Select the stores you want to create the product in. Click save to create the product. Note: Creating a product at one store, will also allow you to create the same product in all your other stores . Similarly, editing any products will also edit those products in all other stores. The SKU or UPC codes are required for every product that is created in the software. When creating a product in one store, the software can also create the same product in all your other stores. This includes all changes that take place within the product. The SKU or UPC codes are used to purchase or sell items. However, serialized items ( that contain a unique serial number such iPhones, tablets, etc.) can only be purchased using the SKU/UPC codes. They cannot be used to sell because all serialized items contain a unique serial number that differentiates them from one another. In order to sell serialized items, their unique serial number must be scanned. On the other hand, Itemized items ( chargers, cases, headphones, etc) can be sold and purchased using their SKU/UPC codes because they do not contain any IMEI or Serial numbers. Add Image: Upload an image of the product through your PC. Capture Image: Capture an image of the product using your integrated camera/webcam. More Images: The software will provide you with a few online images that relate to the product name. Select an image of the product that fits best. Remove Image: Remove an image by clicking on the minus button. 3. Click out from the window and make sure to click save. Override Cost Price: Overriding the cost price will disregard the cost price that was entered in the cost type and will calculate the static cost price that will be entered. By overriding the cost price of a product, its original cost price will not be visible, and the static cost price will be its cost price. Cost on Sale: By selecting this option, you are making the product's selling price equal to the cost price. When creating a product you may select this option from the general tab and click save. When you're selling the item the selling price of that item will be the same as its cost price when you purchased the item. You can later check your profit and loss report which will confirm that there was no profit made by selling the item. Selling these items will not affect your daily target. Scan the barcode of a product in the barcode field. Click the plus icon and save it as your barcode. With the barcode you can easily scan the product and sell or purchase all itemized items in a few clicks! The Maximum and Minimum values allow you to restrict yourself from adding or not adding products to your inventory, For example, if you enter a Max amount for a product, you will only be able to add that number of products in your inventory. And, if you enter a Min amount you will only be able to have that amount in your inventory and not less. Related Products allow you to add any products that are related to the product you are creating so it's convenient for you to add them to the invoice while selling your product. 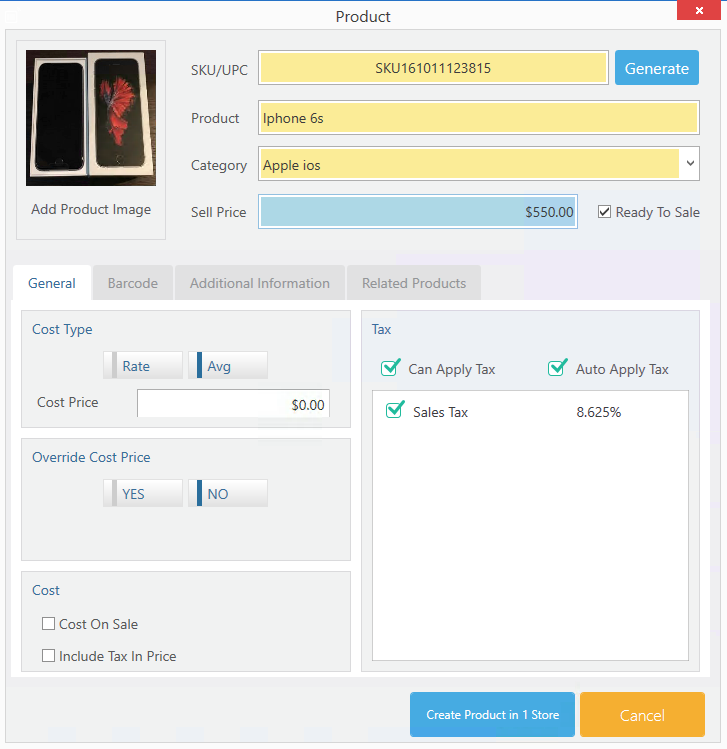 For example, if you add a phone case as a related product to an iPhone it will show up on the main Dashboard while you're selling the iPhone so you can easily add it to the same invoice. You may add related products for items that most frequently sell together. The following image shows a few related items to the product that's added to the invoice.